This course is designed so that students connect content with experiences. In it, they will conduct research projects that allow them to engage in the culture in which they are living, and to employ the content they are studying, so that they become stronger investigators and more experienced global citizens. 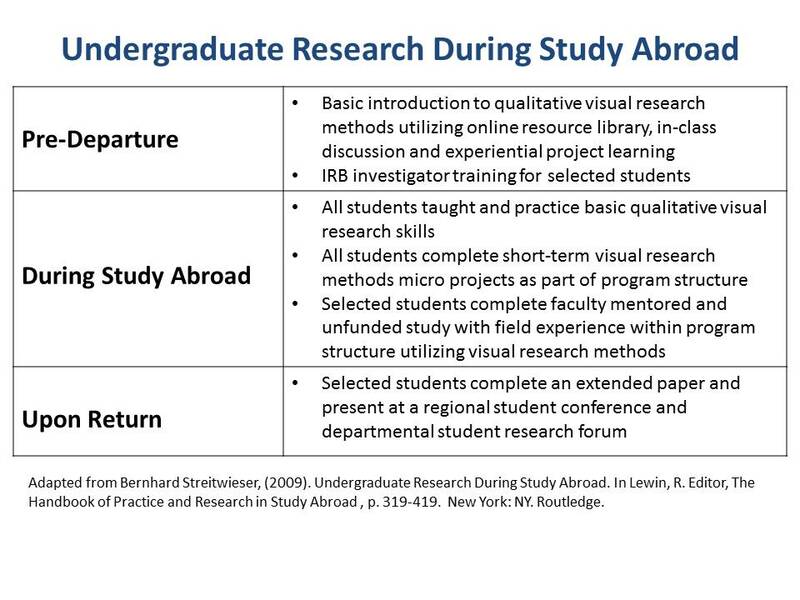 Sometimes, critics of study abroad programs imagine to be a “trip” or a “tour”. This is not the case for students completing this program. Students have 10 small projects to do in 6.5 weeks and participate in a capstone project. This program is unique in design, content, skills development and student work accomplishment. It is a modern course utilizing digital media, online interaction, experiential learning based on research evidence from multiple disciplines taught in a way that concentrates on critical thinking related to necessary important facts. At the end of the course students should be in a position to be able to think and communicate about the relationships studied during the course. The four relationships the course focuses on. 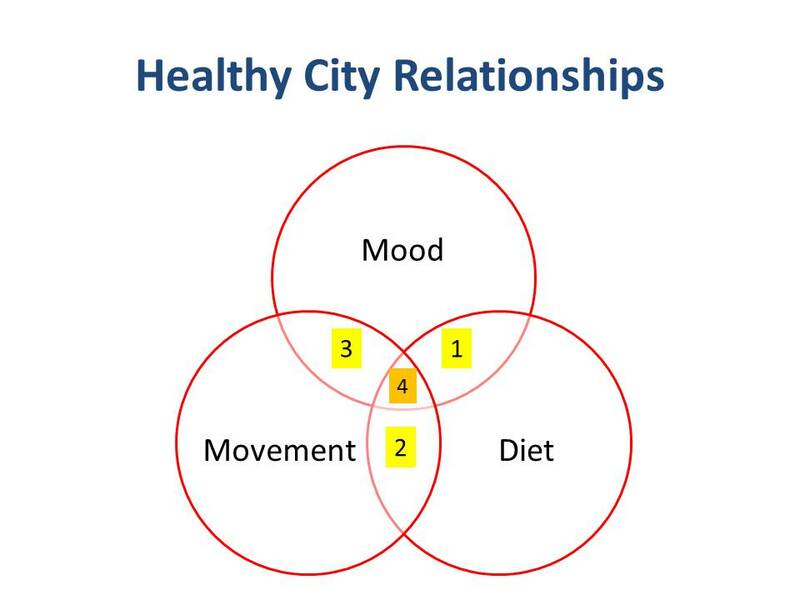 The graphic right shows four relationships this course studies using the healthy cities context. 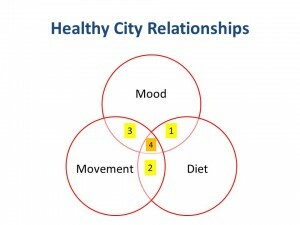 The course design, project work and teaching methods are meant to assist students to come to their own conclusions about the relationships and interactions between mood, movement and diet. Students on this course have an opportunity to reside in Barcelona and use it as part of the classroom. They also have the opportunity to be exposed to ideas and concepts especially selected for a city based program. What kind of research projects are the students doing? In this program, students’ research is hands-on and interactive, using the qualitative visual research methods of photo voice, photo elicitation, observation and participant observation. These methods are meant to answer the questions: “What is happening in this setting?” “Who is engaging in what kind of activities?” “Why are they doing what they are doing?” Each student researcher will discover the kind of healthy city Barcelona is by investigating neighborhoods, participating in Catalan cultural activities and relating the three themes of mood, movement and diet. Inevitably, each student will recognize he/she is not neutral, but an amalgam of his/her personal experience, gender, beliefs, cultural background and awareness. This “reflexivity” is a key aspect of the capstone. Reflexivity refers to the researcher’s aim “to explore the ways in which [his/her] involvement with a particular study influences, acts upon and informs such research” (Nightingale & Cromby, 1999). All course members (including instructor and teaching assistant) will be expected to engage in this process. Regular short written assignments of 200 to 400 words will be required and regular readers will soon see the diversity of experience and view point each student brings to their work. We are accustomed to using text in our fields of study. By using photography as a means of gathering data and perceiving the culture of movement, mood and diet in Barcelona, students have an opportunity to experience Spanish culture with visual accuracy, in all its complex detail, and learn through visual experience about the relationships and connections between people, place and context. The camera acts as a notebook. Its contents stimulate recall, emotion and linkages. Photography allows us to observe close up and far away. It calls for choices and decision-making by the researcher. We can copy, file, locate, duplicate and add photos to an essay, presentation or report. Photographs evoke emotion and provoke criticism and conversation. Photography accelerates our engagement and commitment to our study abroad experience. Photographs can help us map a barrio, distinguish a performance and determine a sequence of important events, but they do not replace text. They augment writing and they allow us to relate to a deeper and richer experience in ourselves and our environment. The photography projects are designed for us—instructors and students—to do things we would not normally do. They give us license to see our environment in ways we might not normally use in Chicago, and they allow us to extend our personal and professional skills beyond the classes we would take and teach at home. In short, we have permission through these projects and this study abroad experience to work together in ways we would not in Chicago. How are students prepared for their projects? Students were provided an outline of the projects about six weeks before departure, then they completed a three day orientation preparing them to engage with the content, develop technical photographic skills and complete a mini-project on the East Campus of the University of Illinois at Chicago. Every student is exposed to the same content and has access to the same materials. Learning is differentiated according to the goals of the students. The Pre-Departure phase shown opposite includes modules on ethics, process and analysis. This learning continues during the program through class and experiential based education. This year’s program has two Helen Barton Scholarship students participating and their requirements are slightly different. New for this year are sociology, rehabilitation sciences and kinesiology graduate cardiac rehab related projects, However, all students have the opportunity to complete micro-projects. These are a single or multiple day projects utilizing research, thinking and presentation skills. Upon return any student may elect to take their work further. The rest is documented on the pages of this blog. Please enjoy Barcelona and beyond in the context of the healthy city initiative through the eyes, ears and voices of our students.